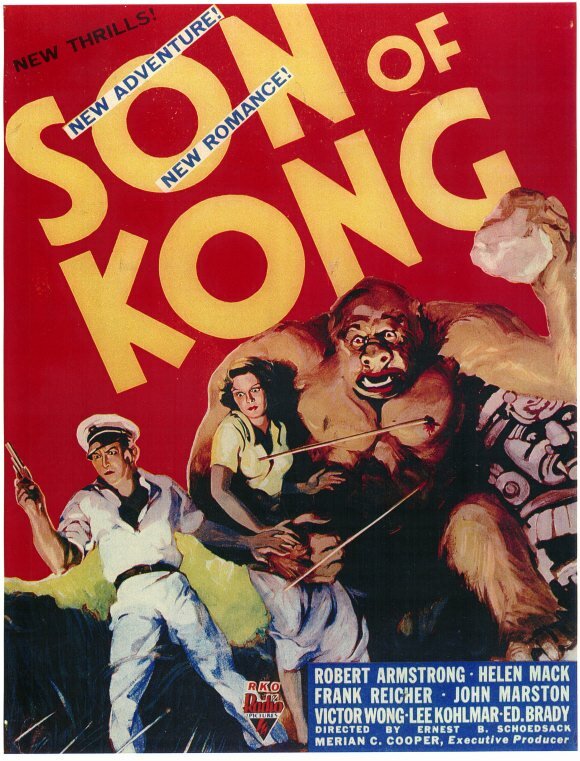 My mother was 7 or 8 when she attempted to watch the 1933 film King Kong with her mom when it aired on TV. She watched as a group set out to sea to make a movie and landed on an island, and when King Kong showed up just the sight and sound of the beast scared her enough to make her hide behind her mom’s chair! She would peek around the corner and shiver in fright of the sight of the giant ape. Way before the gross out films of the 60’s made by the likes of Hershel Gordon Lewis became the norm in what’s “scary” about horror films, the likes of a giant ape with a love for blondes paved the way and terrified the young and old. 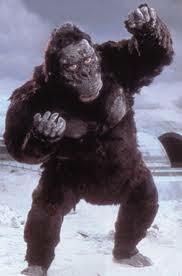 While many not consider it a horror film, I have always viewed it as one as King Kong is a giant ape creature that caused panic not only on his home island but also New York, and he does kill and eat humans so yeah, it spells horror film to me. I saw the film when I was about 7 or 8, the same age she first saw it, and I can remember my Mom telling me about her first viewing and this set the bar very high as I sat down on the couch ready to watch it alongside my parents and my brother on a VHS that we rented from Waynesville’s library. From the moment the film started, I was hooked on every word and when Kong showed up I became a fan, and to me every gorilla toy became King Kong. The watch with my family was a great one and was one of many fun family night of watching a flick on the old VCR while eating popcorn and being entertained. I don’t want to give too much of the plot away of the film as that will happen as we review the Gold Key comic adaptation a little later on so I will give you the cliff notes version. The film is about a filmmaker and some sailors who take a fresh faced new actress to an island were the natives take her to appease King Kong, a giant gorilla who rules the land. They save her and also take Kong to New York as a stage attraction, and he escapes running wild in the city until he is killed in the end. It’s an amazing classic film with special effects that were way ahead of their time. If you have not seen this film, do yourself a favor and watch it! In the 1980’s Ted Turner owned Turner Classic Movies wanted to do something fresh and new to King Kong so they did the unthinkable…. they colorized it! 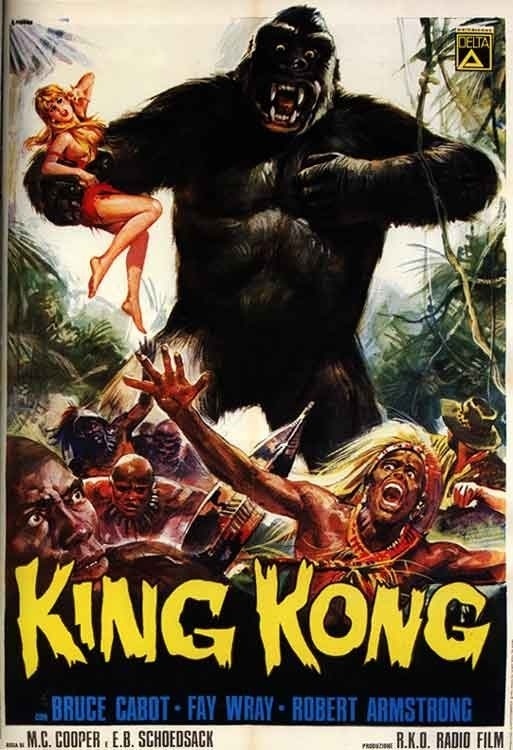 To be honest it seemed like an odd kick Turner was on, taking old classic black and white films and turning them into color films to air on his classic movie station, and on the top of the list that sparked the most debate was what they did to King Kong. I can remember that my mom and dad were not pleased that they messed with a classic film this way, but being so young I was a little curious to see what the classic Kong would look like in color. I seen the color version after the black and white and still preferred the original to the tampered with version. King Kong was the first movie on VHS that I owned two versions of as I had to own them both, and I would say I watched the black and white more than I did the colorized one that I got dirt cheap brand new at Blockbuster Video. 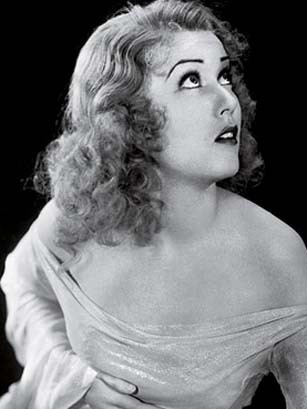 Now if you look at King Kong as a horror film like I do, then you would have to look at Fay Wray as the original scream queen, and she proves she has a set of lungs as she screams her head off at the first site of Kong. She began her acting career making short films and making westerns for Universal but left once she became a WAMPAS Baby Stars meaning she was listed as an actress to watch. 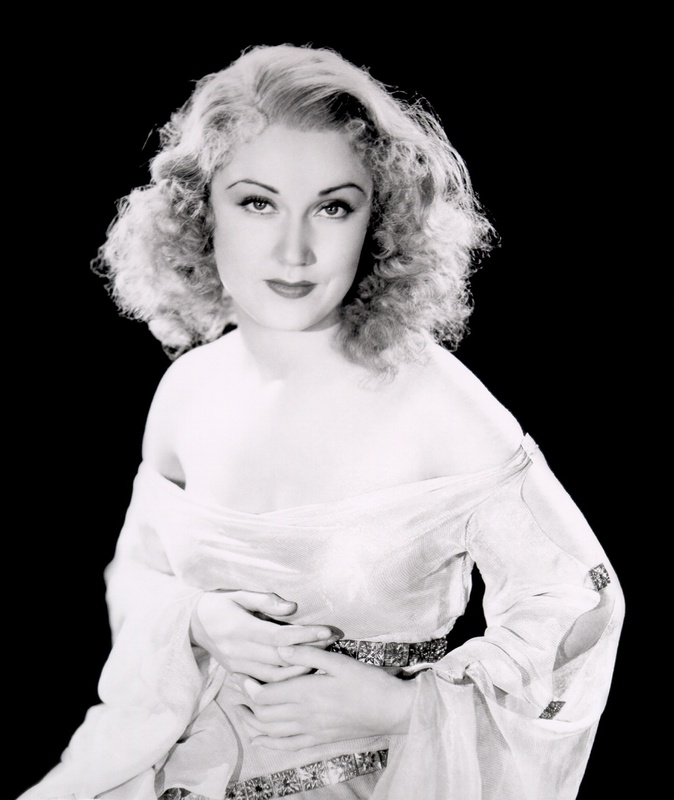 As a teenager Wray was signed to a contract with Paramount Pictures where she made over a dozen films like the failure 1928 silent film The Wedding March. Wray was able to make the transition from silent to talkie films and left Paramount to make other films for other companies, the most notable being RKO that hired her for her first horror films like Doctor X, The Most Dangerous Game and her most famous film King Kong. She was proud of her work in Kong and that film saved RKO from going bankrupt! During that time as well she was in a few other horror films like The Vampire Bat and Mystery In The Wax Museum. By the 1940’s, Wray retired briefly from acting but came back to make more films and take TV parts being on such shows as Perry Masson and Alfred Hitchcock Presents. Wray continued to act for many years and even turned down a part in James Cameron’s 1997 smash hit film Titanic. 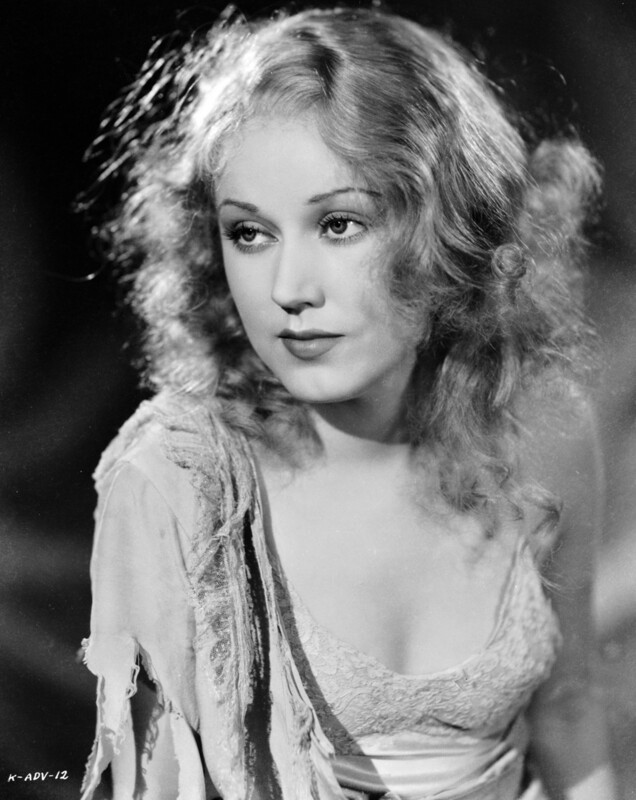 Sadly at the age of 96 Fay Wray passed away of natural causes in 2004 while she slept. After her passing, the Empire State Building shut off all its lights for 15 minutes to honor her legacy. Wray was a true beauty, a talented actress and could possibly be the first scream queen of cinema. Because King Kong was such a huge hit at the box office, a sequel was made in 1933, coming out only 9 months after the original. The film follows the film director from the first film who is now in hot water for King Kong running wild in New York and travels to find that the giant ape might have had an offspring. That film was called Son of Kong! 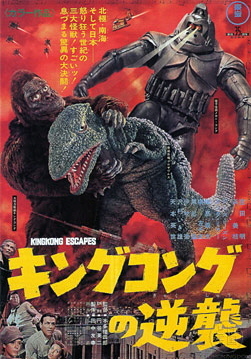 In Japan in 1962, they made a film called King Kong vs. Godzilla where they pit the world’s top giant monsters against each other, and in 1967 they made another King Kong film called King Kong Escapes that has our lovable Kong fighting a robot version of himself called Mecha Kong. 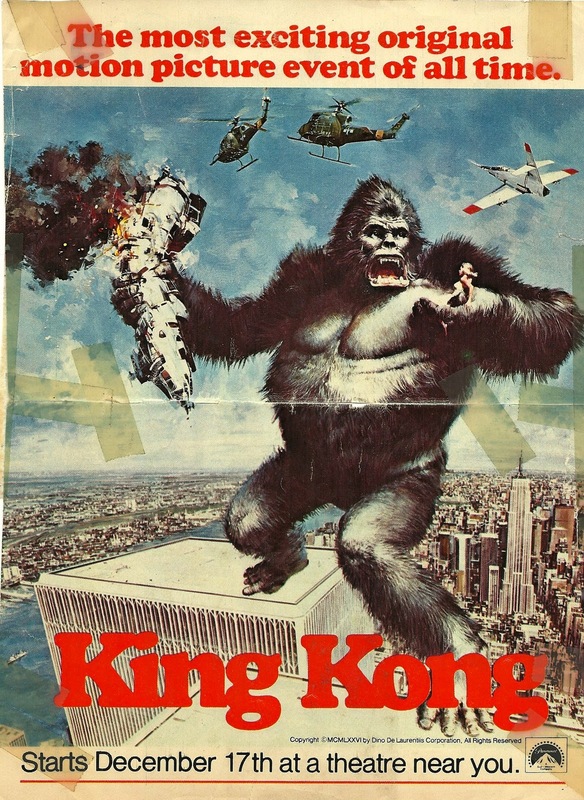 Paramount Pictures in 1976 decided to make a remake of King Kong and added in more modern touches to the film and even trades in the Empire State Building for the Twin Towers as well as the stop motion Kong for a stuntman in a suit done by FX God Rick Baker. 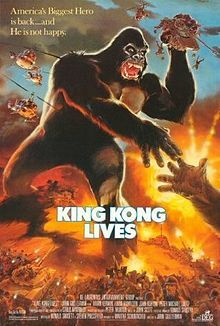 In 1986 the remake got a forgettable follow up called King Kong Lives that had the giant ape getting a pacemaker put in to replace his damaged heart and finding a mate who has also been brought to the USA. 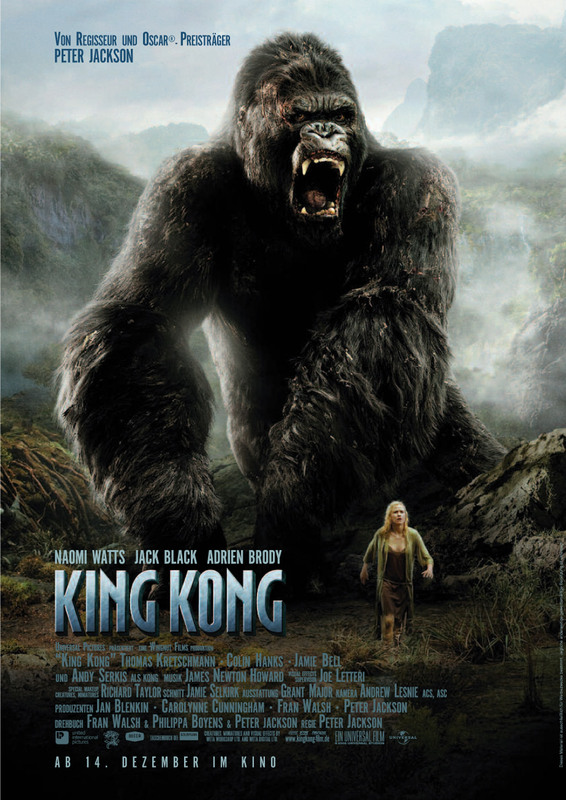 In 2005 a longwinded Peter Jackson remake of King Kong was made and besides more minutes added to the runtime, it was a good but unnecessary film. With all these spin off films, sequels and remakes this just shows you how much impact this film had on classic cinema, and I agree with James Rolfe who said that film students should watch the original in film school right alongside Citizen Kane. While none of them are as good as the original film, they are all still fun watches that help add to the legacy of Kong and prove that this primate of fright, this ape of terror, is truly a legend of cinema. 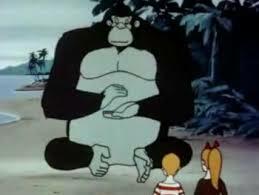 In 1966 America and Japanese animation studios teamed up to make The King Kong Show, an animated adventure kid show that had King Kong befriending the Bond Family and stopping the likes of Dr. Who (and no, not the BBC version) from capturing Kong for his own evil gain. This animated cartoon was teamed with another show about a tiny special agent called Tom of T.H.U.M.B. and the show would last till 1969 with a total of 3 seasons and 25 episodes. This cartoon also helped Toho make the film King Kong Escapes and also was to be inspiration to the film that became Godzilla vs. The Sea Monster, which Kong was suppose to star in, not Zilla. The cartoon over the years did not hold up well and was mostly forgotten until it got released on DVD as volumes a few years back. I never remember seeing the show when I was a kid, and I think it would have fit perfect on early morning Saturday’s back in the 80’s and could have also found a place on the USA Cartoon Express. I saw the show when I was older and in my 20’s found it to be pretty cool but only from a retro standpoint. So as we all know Toho studios made two films with King Kong in them in the 1960’s, but did you know that there are also two others made in Japan way before this that are now lost films? 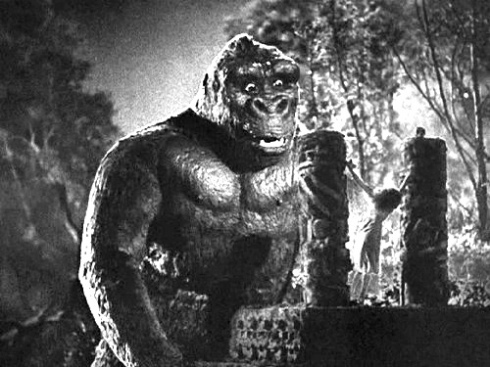 The first was a short silent film called “Wasei Kingu Kongu” made in 1933 the same year King Kong was released and was a team up from RKO and Shochiku Studios. Not much is known about the film besides RKO asked them to make it and that instead of a stop motion Kong, it was a man in a suit. 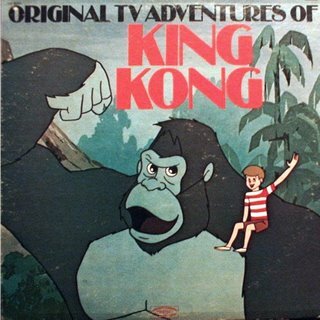 It was directed by Torajiro Saito with Isamu Yamaguchi playing King Kong and all that is left of the film is one single picture that was printed. Next was a 1938 film called “King Kong Appears In Edo” that made by Zensho Cinema with permission from RKO and was directed by Soya Kumagai and had a size changing King Kong attacking Edo (Tokyo) during Medieval times! Fuminori Ohashi who some 16 years later would make the original Godzilla costume made the Kong costume in this film. 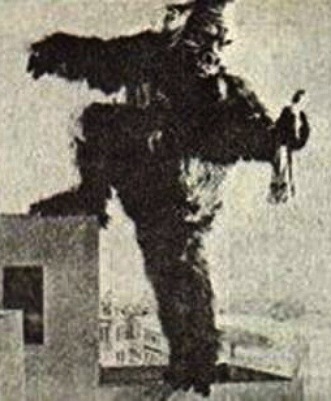 Just think about that, King Kong was really Japan’s first giant movie monster and not Godzilla like we all thought! Both films are believed to have been destroyed during the bombings of World War II and neither ever showed outside of Japan making all master prints being only stored there. I learned about these missing films thanks once more to James Rolfe (Angry Video Game Nerd) when he did a top 10 list of lost Horror Films and the Japan Kong films were his # 1, and I agree with him when he said he hopes all the films he picked won’t always be lost films. Below are some pictures of Japan’s King Kongs, the first being Toho’s with the second being the 1933 version and last being the 1938 one. Tiger Electronics who are best known for making handheld games in the late 80’s and 90’s also made some console games in the age of Atari 2600 under the brand name TigerVision. 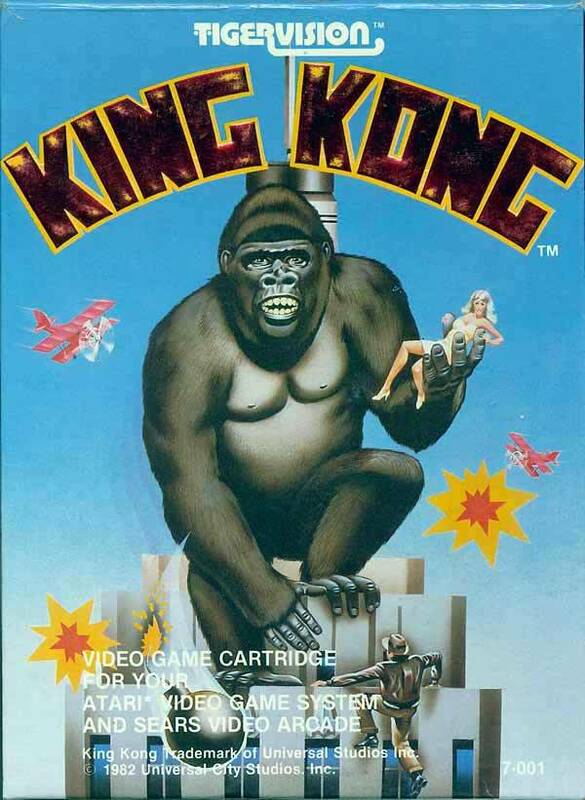 And would you know it that in 1982 they made a game based on King Kong that was a follow up to their handheld games made about the big ape the year before. The game was a total rip off of Donkey Kong and had you playing as a guy who was trying to get to the top were King Kong was. 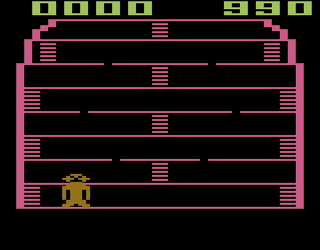 The graphics were bad and Kong was a stiff looking pixel mess. I have played the game several times and even own it and I must say that it really is a bad game. 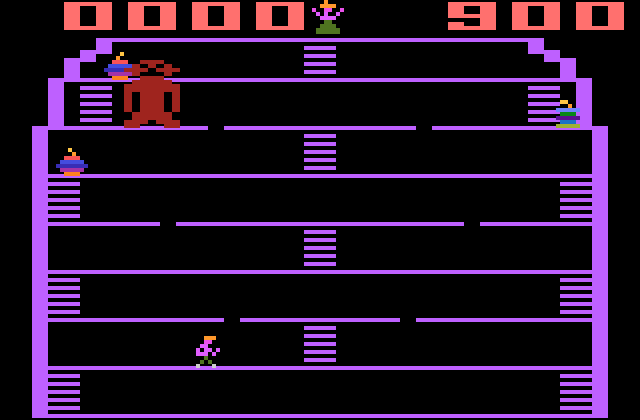 Though I do find it funny that Donkey Kong was a clone of King Kong who in turn had a game made about him that was just a bad clone of Donkey Kong. The game on release only sold moderately well and was by no means looked at as a classic. 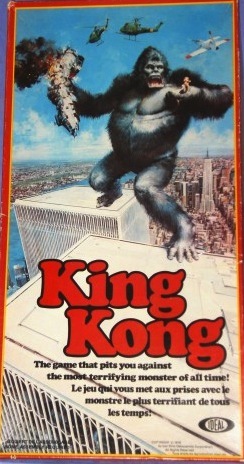 Ideal made a board game in 1976 based on the remake movie that had 2-4 players trying to get to the top of the Twin Towers before King Kong so that they can capture him, or you can win the game by saving the woman from his right hand via a special mission. 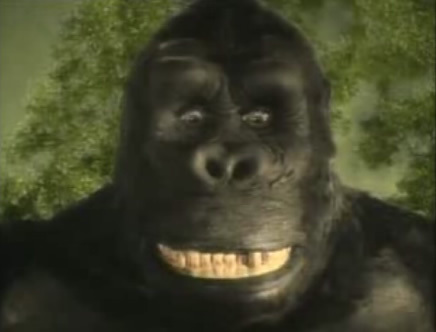 But Kong won’t make your trip easy as he is flipping all around trying to knock your player back to the start. I own this game and played it with the fellow members of The Dayton Board Game Society who are Stephen Alexander II, Josh Weinberg, Jeremy Hoyt and Garrison Kane on one of our past meetings ,and I can remember that while the game was not all that ground breaking we all had fun trying to knock each other off the building using Kong as our puppet and it was a blast seeing just how competitive it got. If you get a chance and like classic board games based on movies then I would say check this one out, play time to complete is about 20 minutes give or take a few. 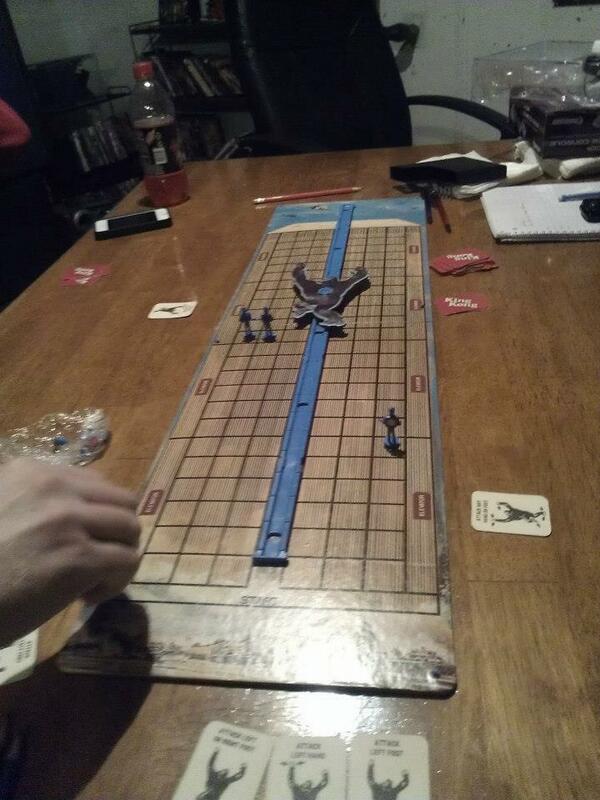 I should also share we played this game on February 6th 2013 in Josh Weinberg’s basement and we also played the LJN A Nightmare on Elm Street video game for the NES and we ate Wing Zone. King Kong not only has been made into many video games and board games but he has also had pinball machines based around him, many comic books, novels, magazines, t-shirts, toys, Halloween costumes, soundtracks, stickers, dolls, drinking glasses and so much more. 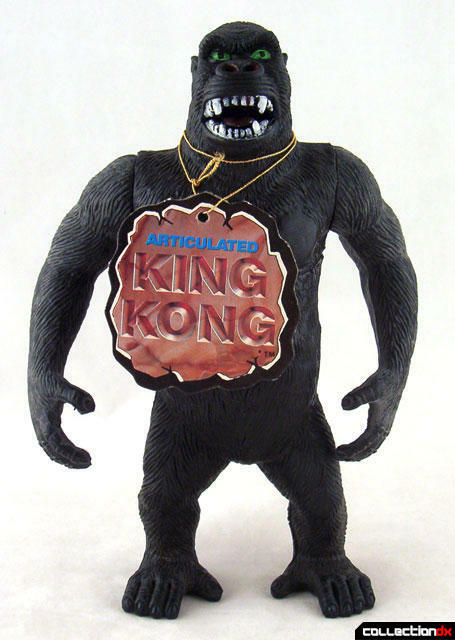 If you’re a King Kong fan, then there is something for you out there in the world of merchandise. 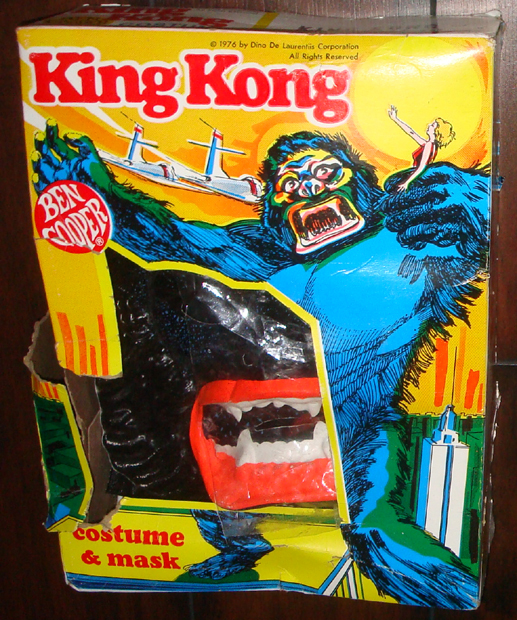 Some of my favorite King Kong merchandise that I owned was my Imperial King Kong action figure that I use to make fight my Godzilla figure and even Kong was wrapped up in my epic Toy Wars, also would be my Crestwood Monster Series Book based on King Kong that gave the history of the film as well as some sweet photos. I also really liked my adaptation novel by Delos W. Lovelace and can remember reading it before bedtime many nights. It’s odd looking back at my youth now being 35 years old and seeing just how much of an impact King Kong has had on my life. It’s a neat feeling knowing that a giant ape with a love for blondes truly means something to me. And for those of you who listen to Alpha Rhythms on WYSO (91.3 FM) on Sunday nights, I have played soundtrack pieces from the original score by Max Steiner as well as tracks from King Kong Lives by John Scott. Before we move onto The Gold Key Comic Review I of course have to talk about a ride I have wanted to go on since I first heard about it; that’s the one and only KongFrontation ride at Universal Studios Orlando that opened on June 7th 1990 and became a major attraction at the park. 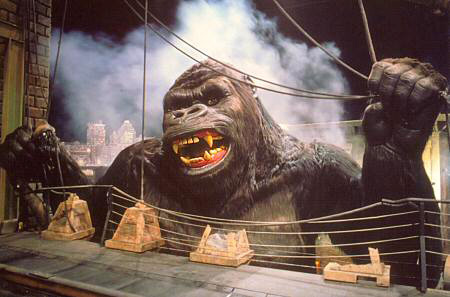 The ride was based on the 1976 remake as well as a ride Universal Studios had at their Hollywood park called King Kong Encounter that opened in 1986. The 5 minute ride would place you and others inside a tramcar but not before you walked down a mock New York street complete with newscasts playing on TVs to build up that King Kong is roaming the streets. Once inside the car you are treated to explosions as well as giant animatronic King Kong’s that would roar and knock your little car around given the effect that he was attacking. In the end he would attack while you’re on the bridge but your driver would get you out safe and unharmed. This ride seemed amazing to me and just the thought of being close to a life size version of Kong was enough to make me want to go, but being a kid and having parents that didn’t like to travel out of state put a damper on getting to go. The attraction closed in 2002, and two years later a lame ride based on the terrible Mummy Remake took its place, marking the sad fact that I never got to ride the one roller coaster/attraction that I always wanted to. 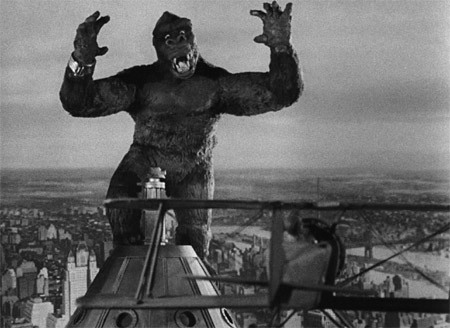 As far as King Kong Encounter, it had guests on a tramcar as King Kong would knock a helicopter from the sky and would end with you being eye level with the great ape on the Brooklyn Bridge as he tries to break it apart. Of course you would make it off the bridge and would be safe thanks to your driver. The Kong animatronic was at the time the world’s largest and was so detailed that it’s “breath” smelled of bananas! This ride as well lasted a total of 5 minutes and was one of the main attractions to the park. Sadly it as well came to an end when in 2008 a massive fire broke out and burnt the attraction up, but in Universal Hollywood they didn’t give up on King Kong and replaced it with an attraction called King Kong 360 3-D. I really would have loved to have ridden these attractions and sadly with both of them gone for good I will never get the chance to do so. But I can watch videos of them on YouTube and hear stories from my friends who did get to experience it…sigh. 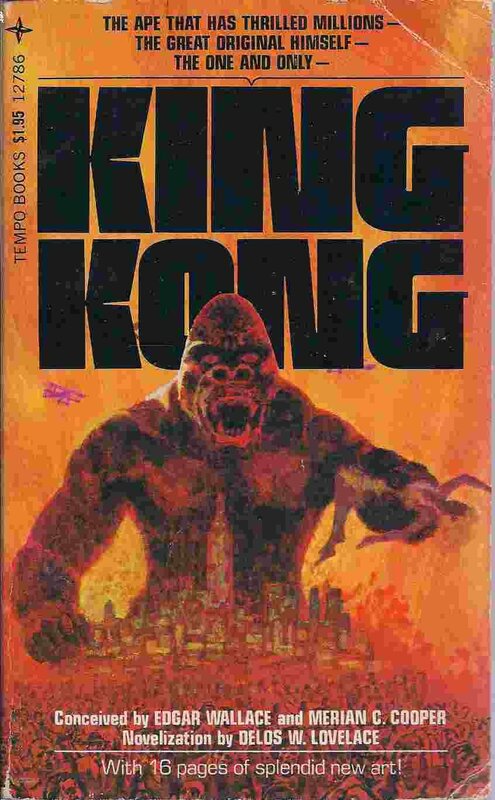 So I think our voyage through the sea of King Kong is over and we looked at the movies, video game, cartoon, missing films, merchandise as well as a theme park attraction but now it’s time for us to take a walk on Skull Island alongside Gold Key comics and see what this 1968 adaptation has to offer to the Kong legacy. I want to think Bell Book And Comic for having this comic in stock, and I would like to remind that I graded on a star scale of 1 to 4 and am looking for how well the comic stays to the source material, it’s entertainment value and it’s art and story. So let’s man up and walk through the giant gates into King Kong’s lsland and hope he doesn’t stomp us into the mud! 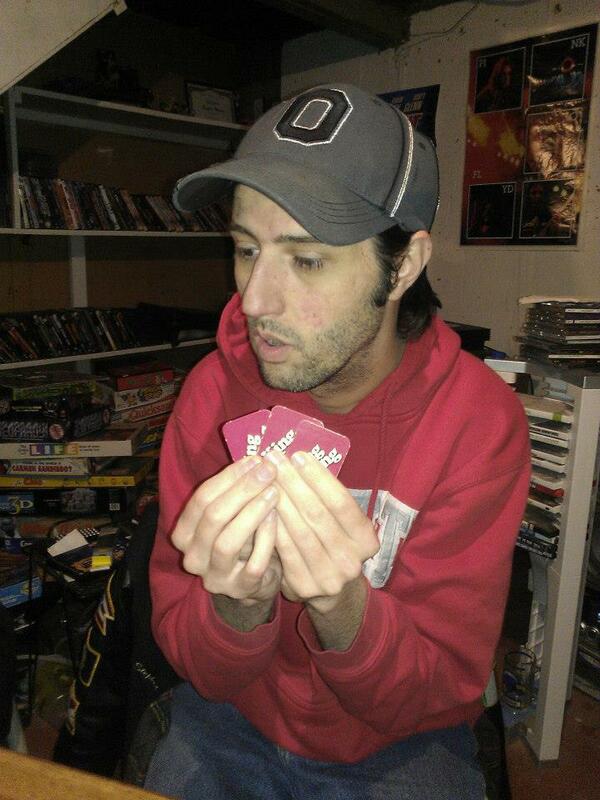 Carl Denham is a filmmaker who can’t find a lead actress for his top secret next project. He even has rented a boat called the “Wonderer” along with all its crew and after an agent tells him that he will not supple him with an actress, the director walks down the streets of New York and finds a pretty thief woman named Ann Darrow who was stealing an apple due to hunger. Denham buys it for her and hires her to be in his new film. While on board the first mate Jack Driscoll falls in love with Ann, and the two start up a relationship. They find out that they are to port at an unknown island called Kong Island. But while at the island they find that the natives are worshiping and sacrificing women to an unknown “God” and they have set their sights on Ann who they kidnap off the boat and take to the altar where a giant gorilla named King Kong falls for her and takes her deep into his jungle home! Driscoll and Denham lead some crew members on a rescue mission and while in the jungle they find that Kong is not the only giant monster as dinosaurs and sea serpents all blocking their trail to save Ann from Kong’s grip. Kong finds that he is being followed after he beats up a pair of Triceratops and knocks all the crew members off a log killing them leaving only Driscoll and Denham left. As Driscoll follows Kong, Denham goes back to the ship for more men and gas bombs. King Kong while trying to grab Driscoll from a cave is attacked by a T-Rex and a major battle breaks out between the giant beasts! 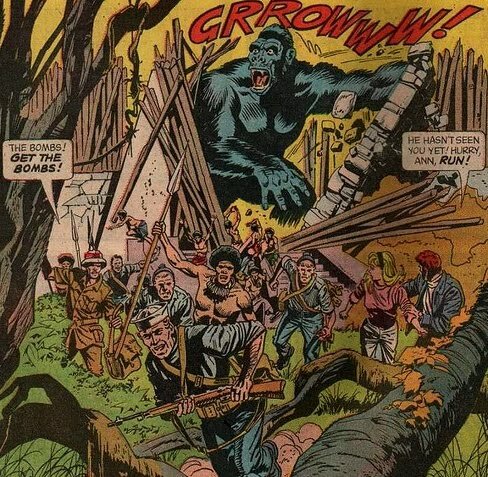 As Kong climbs to his cave home he must fight off all types of attackers and during this Driscoll saves Ann, and the two escape via the river below. As they reach the gates Kong is in hot pursuit and it’s here that Denham uses his gas bombs to knock Kong out and then takes him to New York to use the giant ape as a sideshow, but when Kong see’s Ann again he breaks his chains and escapes his cage and takes Ann to the top of the Empire State Building where he is attacked by fighter planes that lead to his death as they use machine guns on him while he is distracted by Ann being saved by Driscoll again and he falls to his death. In the end Ann and Driscoll are safe in each other’s arms, Kong is dead in the middle of the street and Denham learns that it was beauty that killed the beast. This is another amazingly done comic film adaptation of a classic horror film much like Comic Library International’s Edison’s Frankenstein 1910 that holds just so true enough to the source material but still adds its own flare to spice it up. The plot is your simple Beauty and The Beast and follows a young actress who gains the affection of a tough sailor as well as a giant ape and when the big primate is taken away from his home and placed in the big city, his only comfort when he escapes is his blonde bombshell but even love can’t save him from being slain. Ann Darrow is a sweet woman who turns her misfortune of being poor into fame when she takes the part in a movie that leads her to charming King Kong to be put on display. Even though Ann fears Kong she also still feels some affection for him and wishes him no ill will and even tries to save the beast as the planes shoot him down. 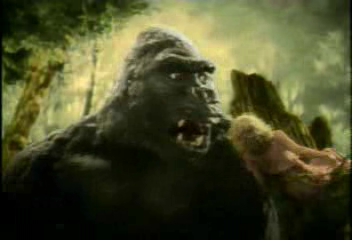 King Kong is neither good nor bad and it’s clear he is very territorial of his land and very protective of Ann who he has fallen in love with. I love the fact that he keeps not only the natives in check but also all the other giant beasts that live on the island proving he really is the King. Carl Denham, while a money grubbing rich film making geek, still really shows he cares about his friends as Ann’s safety when being taken is a big priority to him, though he does mistreat King Kong by keeping him in chained up and taking him away from his home to be looked at by New York’s rich snobs and press. Jack Driscoll is your very classic tough guy who only cares about the woman he loves and will risk it all for her. The major changes I noticed between the comic and the film is that in the comic the ship is called The Wonderer, while in the film it’s The Venture; in the comic the island is called Kong Island, while in the film it’s Skull Island. I also noticed in the film Jack is annoyed that Ann is on the ship and it takes awhile before he falls for her, in the comic it happens fast. This was the second time I have read this comic and I found that I enjoy it more and more after each read and find something very magical about the whole reading experience. The copy I have is a classic example of Rotten Ink as the smell of the decomposing ink fills your nose when you flip through the pages, while not a beat up copy, it’s still very yellowed on the pages. The artwork is done by ummm….an unknown artist as no credit is given, but I must say the art is perfect for this comic and while Kong doesn’t capture the full look of his movie appearance it still looks the part enough to draw this comic reader in. 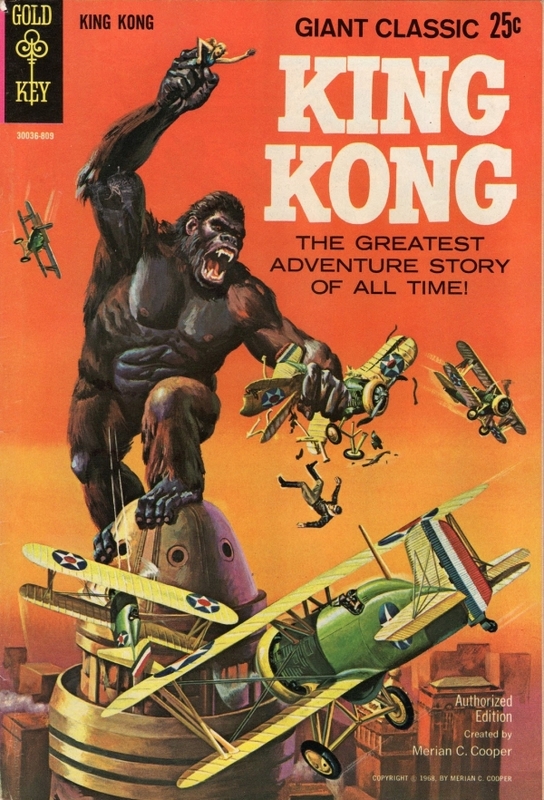 The cover as well is very eye catching and I am sure drew kids attention to it by using lots of orange and putting a giant ape crushing planes on the cover. If you like the film or like classic horror comics, than this is for sure one you should check out. I am glad I got it and I am sure a few years from now I will read it again. Below is a piece of art from the comic just so you can see the style Gold Key went for in this comic. Really this is a great comic with great classic artwork and really is going to help us kick off our two month long horror comic countdown to Halloween 2014! So on this update we traveled to Skull Island and got to know King Kong and see what that massive beast was about, but how about next time we travel to a black lagoon and celebrate the 60th birthday of the Universal Monster Gill-Man. So until then read a comic or two, watch a horror film and support your local Horror Host. This entry was posted in Comics, Gold Key and tagged 1933, 8TH Wonder Of The World, Alpha Rhythms, Angry Video Game Nerd, Ann Darrow, Atari 2600, Bell Book and Comic, Bobby Bond, Bond Family, Carl Denham, Cartoon, Cinemassacre, Classic Monster, Comics, Crestwood Monster Series, Dayton Board Game Society, Dr. Who, Empire State Building, Fay Wray, Garrison Kane, Gold Key Comics, Gorilla, Grandma Salyers, Hollywood, Horror Films, Jack Driscoll, James Rolfe, Jeremy Hoyt, Josh Weinberg, King Kong, King Kong 1976, King Kong 2005, King Kong Appears in Edo, King Kong Encounter, King Kong Escapes, King Kong Lives, King Kong vs Godzilla, Kong Isle, KongFrontation, Lost Film, Lumpy, Max Steiner, Mecha Kong, Merian C. Cooper, Mom Brassfield, Movie, New York, Novel, Paramount Pictures, Peter Jackson, Professor Bond, RKO Pictures, Robert Armstrong, Scream Queen, Skipper, Skull Island, Son Of Kong, Stephen Alexander II, Susan Bond, T-Rex, Ted Turner, The King Kong Show, The Venture, Tiger Electronics, Toho, Tom of T.H.U.M.B., Toys, Turner Classic Movies, Universal Studios, VHS, Video Games, Wanderer, Wasei Kingu Kongu by bloodlinematt. Bookmark the permalink.